So You Can Get Back to Living! At Miami Valley Smiles, we know the loss of your natural teeth can be a traumatic experience, and traditional removable tooth replacements like bridges and dentures are nothing like the real thing. They don’t stay in place, they make it difficult to eat comfortably, and can be a pain to clean and maintain. That’s why we’re happy to be able to place and restore dental implants from the comfort of your dental home. Dental implants are the best tooth replacement solution on the market and we would love to help you secure your smile so you can get back to living your best life. Dr. Lance can complete the whole process from the comfort of your dental home – no need to drive across town to find a specialist! Dental implants have truly revolutionized the dental industry as we once knew it. Traditionally, replacement teeth (bridges and dentures) only included the crown or the visible portion of the tooth, leaving the tooth root – an essential component of a healthy, functional smile and jawbone – missing. Without the tooth root, the underlying jawbone will begin to deteriorate or atrophy which can cause a whole lot of problems. A shrinking jawbone can change your alignment and bite which can cause pain in the form of TMJ pain, headaches or migraines. Bone loss in the jaw eventually will change the shape of your face, causing that sunken in appearance you’ve seen in patients with missing teeth. Dental implants are small posts or screws, typically made from biocompatible and durable titanium, that are surgically inserted into the gums and jawbone. Dental implants replace the root of a lost tooth, helping to preserve the healthy jawbone and serve as an anchor for a stable and functional new tooth or set of teeth. 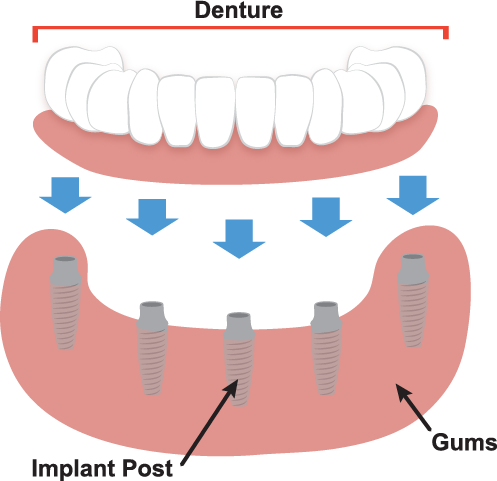 Dental implants can replace a single missing tooth with an implant and a crown, multiple missing teeth with an implant supported bridge, or a full set of teeth with implant supported dentures. Surrounding teeth shift and rotate. TMJ pain, headaches or migraines. Sunken face and premature aging. Dental implants help prevent these consequences, and allow you to live life just like you did before missing teeth. The dental implant process begins with a consultation with Dr. Lance to determine if you are a good candidate for implants. To be a candidate for dental implants, patients must have relatively good health and sufficient jawbone density to host the implant. If you don’t have enough jawbone density, we may be able to perform a bone graft to supplement the jawbone, depending on your individual case. Once given the green light, you will schedule an appointment to have your implant(s) placed. Dr. Lance has the advanced training and technology to surgically place implants right here from the comfort of your dental home, so you don’t have to worry about finding a dental implant specialist or implantologist in Miami Valley. We may use any combination of local anesthetic, general anesthetic, and sedation depending on your individual needs and preferences to ensure your comfort through the placement process. Once your implants are placed, they require a healing period of three to six months to ensure optimum healing and integration with the jawbone. That’s right, your jawbone sees the implant just as a natural tooth root, and will fuse with it to create a sturdy, fully integrated, life-like base for your new tooth or teeth. After the healing period, you will return to have your final restoration secured. Whether that’s a single tooth crown, a multi-tooth bridge, or a full set of teeth with implant supported dentures, you’ll be able to leave with a fully secured, fully functional, and fully amazing smile. If you have any questions about dental implants or would like to schedule an appointment with your Mason implant dentist, Dr. Lance at Miami Valley Smiles, give us a call today at (513) 445-4064 or request an appointment online below! We look forward to smiling with you.